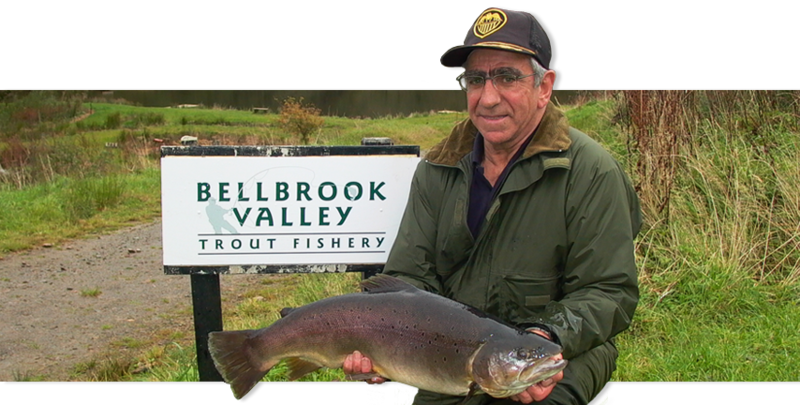 Dear Chris Bellbrook, I would like to thank you for providing such an excellent venue, apart from such a beautiful environment, your fish are in first class condition. They eat well both grilled and smoked. I look forward to visiting you soon. (no doubt with some chums). With best wishes Paul Becker. There are two options for self catering at Bellbrook - the Annex attached to the farm house OR the static caravan located right next to one of the lakes and totally away from everything! The caravan has been replaced this year with a newer model and has all mod cons! The accomodation consists of a double bedroom,a twin bedroom, bathroom, galley kitchen, lounge with dining room plus the option for two singles in the lounge. The provision of heating makes this a suitable destination at all times of year and there is also wooden decking and an outside porch for your fishing gear, wet boots, wet dog etc. It is the location that makes the caravan a stunning getaway for a family or those looking for a romantic break for two. It is literally in the middle of nowhere with a single track down through the valley for access - this is a lovely remote spot next to the fishing lake which is now private for residential guests only (please enquire for details). Please see Terms and Conditions at the bottom of this page. All reservations are subject to the following conditions. The accommodation is offered for hire subject to being vacant on receipt of deposit. Telephone reservations will be held provisionally for five days pending receipt of deposit. Bookings commence at 4pm on Fridays and terminate at 11am on Fridays, unless alternative arrangements have been agreed. If through unforeseen circumstances, cancellation is necessary after the deposit has been paid, we will endeavour to re-let. If successful, we will refund any monies received. Keys must be collected during normal office hours (9am to 5pm). The number of persons must not exceed the number when booking. We reserve the right to refuse or terminate any booking due to unreasonable behaviour from tenants without refund. Tenants must pay for or replace any damage or loss/breakage of contents. Bookings cannot be accepted from persons under the age of 18 years. One dog is permitted for an additional charge of £25.00 per visit to be paid with deposit. Any additional cleaning or damage by pets must be paid for in full before departure. Dogs must be kept on leads. Under no circumstances can animals be left inside during their owners’ absence during the day or night. We cannot be held responsible for any personal injury, or loss or damage to personal property, including vehicles. Parents are asked to see that their children behave appropriately while on the property. As a trout fishery there is deep water with no guard rails or warnings. All visitors are expected to respect the tranquility and other visitors.